Rev. Ronald H. Guettler was born in Columbus, Nebraska, on February 11, 1934, to Armin H. Guettler and Clara H. Genz. He attended Immanuel Lutheran School and Kramer High School. After graduation he attended St. John=s College in Winfield, Kansas, and graduated with an A.A. in 1952, after which he attended Concordia Seminary in St. Louis, Missouri, graduating in 1957. Rev. Guettler vicared at Bethany Lutheran Church in Vacaville, California, 1955-56, under Rev. Robert Wolter, of Fairfield. During this time, he built his first church working with a number of laymen. Rev. Guettler was ordained into the Holy Ministry on July 7, 1957, at Immanuel Lutheran Church in Columbus, Nebraska. He received a call to St. Mark Lutheran Church, on Richfield Road in Flint, Michigan, and Faith Lutheran Church in Grand Blanc, Michigan, being installed at St. Paul Lutheran Church, in Flint, on July 21, 1957. Rev. Ronald Guettler and Marilyn Janet Pasche, were married at Redeemer Lutheran Church in Flint, Michigan on September 28, 1958. While at St. Mark Lutheran he helped build the new church, dedicated on September 27, 1959, built a parsonage in 1959; and built a school and added to the church, dedicated on February 9, 1969. Rev. 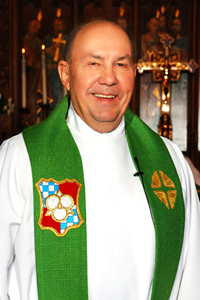 Guettler was called to St. Paul Lutheran Church in Royal Oak, Michigan, and installed on March 1, 1970. He helped to build a new church building which was dedicated on January 22, 1973. During his pastorate at St. Paul’s, he supervised 26 vicars and over a half dozen parish assistants. Rev. Guettler retired from St. Paul on June 30, 1996. During his pastorate, Rev. Guettler has served the Michigan District and community in various capacities: Served on the Michigan District Church Extension Board from 1977-80, as Vice-President one year…Served as Chairman of the Church Extension Board from 1983-1995. Served on the Mission Board, 1962-1970. Was Counselor for Flint Zone Walther League. Served on ad hoc committees with the Board of Stewardship and the Board of Education. Served on the Building Committee of the student chapel at Central Michigan University, Mt. Pleasant, Michigan. Served as chaplain for the Lutheran Hour Reformation Rally at Cobo Arena. Served as delegate to the Lutheran Church-Missouri Synod Convention in Milwaukee, Wisconsin, 1970. Served as chairman of Campus Property Study Committee and Campus Task Force. Served as secretary and chairman of the Royal Oak Pastors’ Association. Served as chaplain to the Royal Oak Police and Fire Departments for ten years. Rev. Ronald Guettler began assisting at Historic Trinity Lutheran Church in downtown Detroit on October 27, 1996. Rev. Ronald and Marilyn Guettler were blessed with four children: Mary Catherine, born January 4, 1960; Julia Claire born September 1, 1961; Christina Emily born March 3, 1964; and Joseph Henry Peter born July 20, 1970. They are also grandparents to twelve grandchildren: James Henry, Alexander Paul, Maximilian Christian, Lily Christiana, Emma Christabelle, Henry Thomas, Thomas Gustavus, Theodore William, Mackenzie Suzannah, Nicholas Joseph, Benjamin John, and Victoria Isabelle.